Racers who select the Golden Racer option will start in their appropriate race division (men’s or women’s race) but race a shorter course. They will round the marker at the Junior Race Point (1/2 way up the mountain) and return down the mountain to the finish line. The optional Golden Racer opportunity is available to racers 70 years and older who have completed 10 or more adult races. Golden Racers must reach the Cut-Off time Checkpoint at the Junior Race Point (1/2 way up the mountain) within one hour (60 minutes) of their start time and complete the race within 2.5 hours to receive an official Golden Racer finish time. 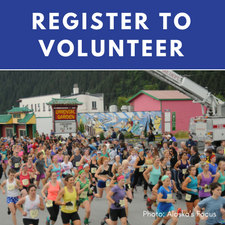 Racer interested in the Golden Racer option should register for the race and then request the option by completing the on-line form below before race registration closes March 31. The committee is offering this option to encourage older competitors to continue participating in the Mount Marathon race. The race community and spectators are inspired by older athletes and their participation is part of what makes Mount Marathon such a unique and special community event. The committee will work with racers 70 years and older to determine the permanency of this option. *	I have registered and paid the applicable fee, for this year's race with '10-Year Status'. *	I will be 70 years of age or older on race day. *	I would like to race as a Golden Racer in 2019.